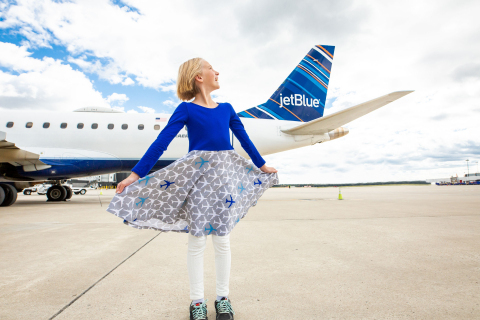 JetBlue (NASDAQ:JBLU) today announced a collaboration with Princess Awesome, a clothing company whose mission is to give girls options that reflect their full range of interests. Princess Awesome teamed up with JetBlue for the special aviation-themed "Airplanes Collection," featuring blue jets as the focal point of the line. This capsule collection highlights both JetBlue's and Princess Awesome's commitment to providing access for girls to pursue interests in science, technology, engineering and mathematics (STEM). The Airplanes Collection includes dresses, leggings, scarves, shirts in infant and girls sizes and is available exclusively from November 8-19, or while supplies last, on ShopJetBlue.com – JetBlue's online shopping site for branded and related gear. Pieces from the line will be available at Princess-Awesome.com after November 13. "The launch of the Airplanes Collection coincides with National STEM Day, further highlighting JetBlue's and Princess Awesome's efforts to encourage young girls' ambitions in fields that are traditionally under-represented by women," said Elizabeth Windram, vice president marketing, JetBlue. "Cultivating an interest in STEM at a young age is critical to a variety of career opportunities, including aviation." To bring the collection to life, one model and one contest winner were photographed at Baltimore/Washington International Thurgood Marshall Airport (BWI) in the new Airplanes Collection and where they had the opportunity to view JetBlue's operations. Princess Awesome makes clothing that honors the wide range of girls' interests. Co-founders Rebecca Melsky, a teacher and mother of two, and Eva St. Clair, a stay-at-home mother of four, started Princess Awesome in 2013 when Rebecca encountered a problem. She wanted to foster her daughter's interest in math, science, and adventure, but her daughter would only wear dresses. Princess Awesome believes there's nothing mutually exclusive about loving twirly dresses and also loving trucks, science – or airplanes. Princess Awesome teamed up with the empowering t-shirt brand Free to Be Kids to create the shirt for the Airplanes Collection. For more information on Princess Awesome, visit Princess-Awesome.com. According to Women in Aviation International, only seven percent of U.S. pilots are women. Both JetBlue and JetBlue Foundation are dedicated to introducing students from traditionally underserved communities, particularly girls, to STEM and aviation and helping increase these numbers. Giving back is part of JetBlue's DNA and is core to its mission of inspiring humanity. The airline focuses on the areas that are most important to the airline's customers and crewmembers – Community, Youth/Education and the Environment. JetBlue's core programs and partnerships directly impact the areas where its customers and crewmembers live and work by enhancing education and providing access to those that are traditionally underserved.